Trim your spare ribs St. Louis style (check out our video on how to trim St. Louis Style Ribs here). Rub a layer of House of Q Slow Smoke Gold Mustard Sauce over all surfaces of the ribs, as well as the rib tips. Season with R Butts R Smokin’ Cherry Habanero. Let the rub set up until the rub appears moist on the surface of the ribs. Place the ribs and rib tips on the second shelf of the grill. Prepare the remaining ingredients. Combine the remaining ingredients in a Lodge 12” Cast Iron Skillet and carefully mix well. For sweeter beans, use the full 2 cups of Plowboys BBQ Bean Buddy. For less sweetness, use 1-1.5 cups Bean Buddy. When the ribs have been smoking for 45-60 minutes, place the skillet on the grill grate directly below the smoking ribs. Close the lid of the grill and let the beans and ribs cook. When the ribs and rib tips reach a dark red mahogany color (about 3-4 hours into the cook), remove them from the grill and wrap each tightly with foil. Return the ribs and rib tips to the grill and increase the temperature to 325ºF. Continue cooking the beans until the onions and peppers are tender and the beans have reached your desired consistency. You can always add more liquid (stock or water) to thin the beans out, if you feel they’ve reduced too far. Remove the skillet from the grill and cover with a heavy cast iron lid. Set aside and leave at room temperature. Continue cooking the ribs until the meat is tender, and nearly falling off the bone, about 5-6 hours total. For the rib tips, separate the meat from the cartilage. Discard the cartilage. Shred the rib tip meat and add to the beans. Taste the beans and adjust seasoning, as needed. 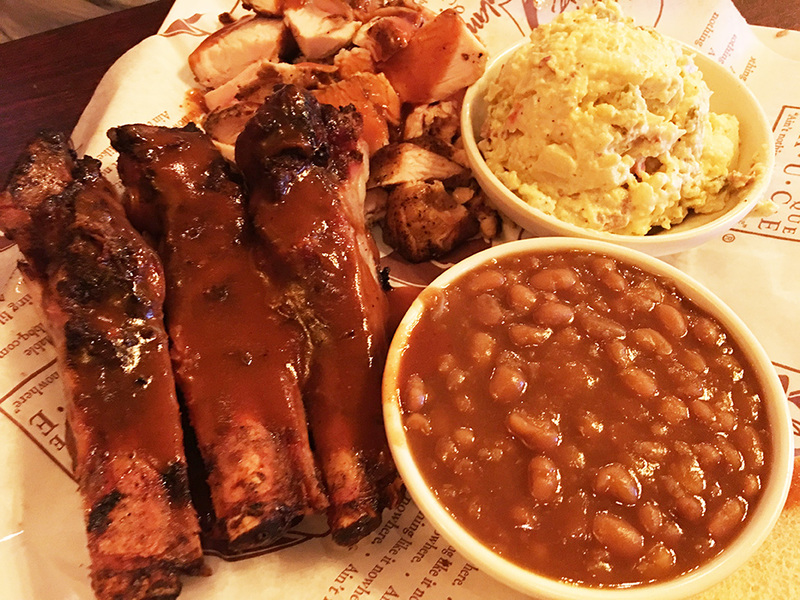 Slice the ribs and serve the Barbecue Smoked Beans with Spare Ribs.